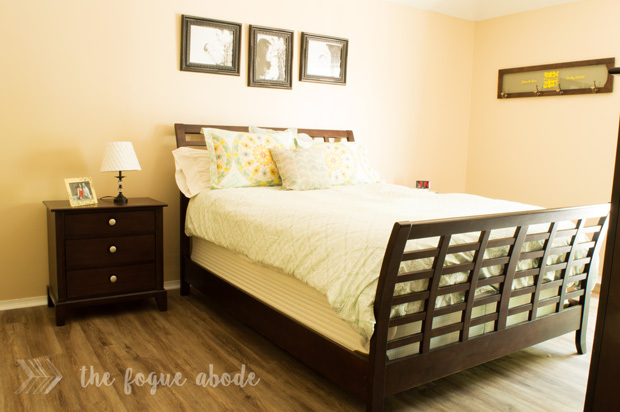 A couple of weeks ago, I shared our current master bedroom with you in a post titled Master Disaster. I can use one word to describe this room, bland. From the matchy matchy furniture to the beige walls. The is the most basic of all bedrooms. If this were a skinny little white girl, she would be wearing Uggs with a baggy brand t-shirt carrying her starbucks. That’s how basic this room is. I’m ready to add some color and some character to this room in a bold way. Give it a little life. I want to start this room off with a statement piece in the form of a green nail head bed. This opens up so many avenues for some fun. You could use simple white bedding in a not so basic kind of way and it would make this pop. Beneath the bed I would add this greige and blue Persian rug. 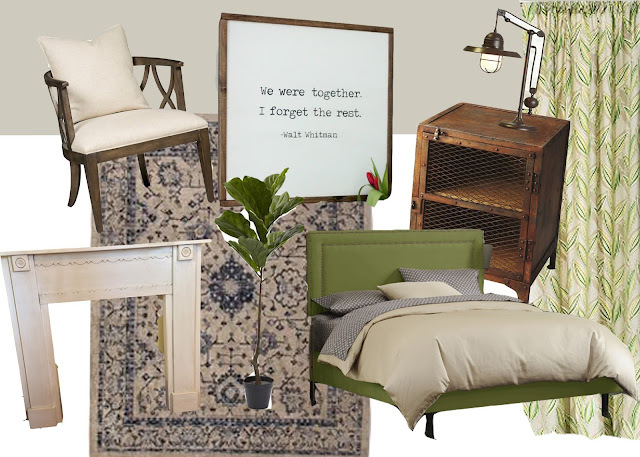 I love the feel of the warn and weathered rug to bring this room down to earth and give it that homey feel. I have come to the realized that I have an obsession with the botanical leaf wallpaper, ala Blanche’s room from the Golden Girls. I have seriously seen this all over the web lately. According to Bower Power‘s Trend Report, this is on pace to be the next trend. So when I found these curtains at Target, I knew they would be the fun colorful piece for this room. Instead of sitting our tv on the nightstand, I want to take a more creative approach. I would love to find a vintage mantle to place on the opposite wall as the bed. This would be a fun piece to periodically change up it’s look and bring something new and fun to the room. Or, something else for me to decorate each season, hehe. For nightstands, I chose these industrial tables I found on wayfair. 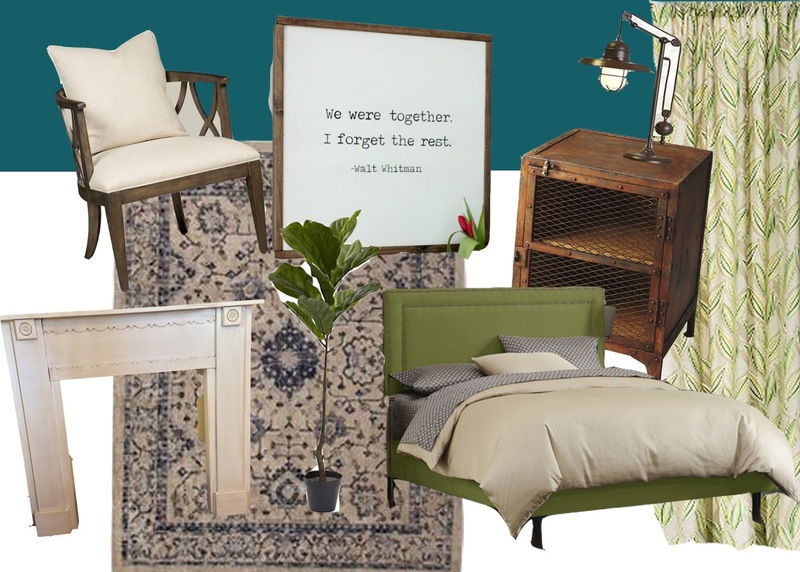 Much like the rug, it would give it a touch of old world charm, while keeping the room itself totally modern. Finally I would add in a few classic farmhouse pieces, just to give it that farmhouse touch. The color I have here as a possible wall color is from Joanna Gaines paint collection called Gathering. But, I thought about giving the room an even more dramatic flare to it and test drove the paint color Weekend. So, I’m totally curious, which paint color would you go with?